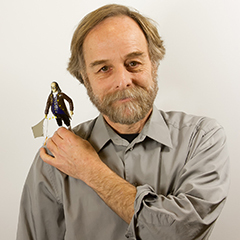 Scot Osterweil is the Creative Director of the Education Arcade and a research director in the MIT Comparative Media Studies/Writing Program. He is a designer of award-winning educational games, working in both academic and commercial environments, and his work has focused on what is authentically playful in challenging academic subjects. He has designed games for computers, handheld devices, and multi-player on-line environments. He is the creator of the acclaimed Zoombinis series of math and logic games, and leads a number of projects in the Education Arcade, including the MIT/Smithsonian curated game, Vanished (environmental science), Labyrinth(math), Kids Survey Network (data and statistics), Caduceus (medical science), iCue (history and civics) and the Hewlett Foundation’s Open Language Learning Initiative (ESL). He is a founding member of the Learning Games Network (www.learninggamesnetwork.org).